Chien-Ming Wang is scheduled to have a battery of tests today to find out exactly what happened to his right foot after he rounded third base in yesterday's game against the Astros in Houston. First of all, Sabathia will be a free-agent at the end of the season and will demand, deservedly so, at least the same amount of money that Barry Zito gets. In the past, this would not have been an issue for the Yankees. However, this past off-season, when Johan Santana was on the trading block, they passed. They passed on it partly because they didn't want to trade away their future, but mostly because they didn't want to have to give a pitcher a huge amount of money. So if they didn't want to give Santana, who is aguably the best pitcher in the game, that huge amount of money, why would they want to give it to Sabathia? That leads me to my next point: If they're not willing to sign Sabathia, would they still be willing to trade away their future for him? Indians GM Mark Shapiro isn't going to give up his ace for just anyone. He'll demand the best, especially when he sees how desperate the Yankees are. The name I keep reading on other blogs and sites is Robinson Cano. I know he's having a poor season, but for the life of me, I cannot see the Yankees saying goodbye to five-tool player Robinson Cano for a half-season of CC Sabathia. Melky Cabrera is another story. However, his upside isn't as strong as Cano's so, I doubt Shapirio would be interested. 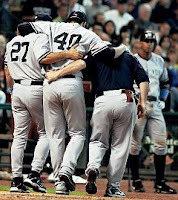 I don't know what the future holds for the Yankees if Chien-Ming Wang's injury is long-term, but I definitely don't see CC Sabathia as being part of it. If the Yankees wouldn't trade top prospects for Santana it doesn't make sense they would trade top prospects for Sabathia. However, maybe Hank Steinbrenner will get involved and order Cashman to make a trade. The Yankees are struggling and with the injury to Wang they are going to have to do something to get over take the Red Sox. I can't see Yankees ownership standing back and watching the team not make a serious push this year.